Watch Captain Artemis – born into violence, recruited into the Mortifactors, his talents in the art of detecting and slaying the merest hint of xenos taint saw him plucked from his Chapter and sworn to lead Kill Teams of the Deathwatch. The first to respond to the distress signals from Port Demesnus, and the first to realise Eldrad Ulthran’s moves, he has diverted his strike force to Coheria. The battle for this moon, and the events that transpire, will send shocking reverberations throughout the galaxy. In the Death Masque boxed game, you’ll find two forces of Citadel Miniatures with which to re-create the tense battles set upon Port Demesnus. The included booklet contains 3 Echoes of War missions which allow you to play through the story, with full background explaining each battle. Full rules for all the miniatures are included, with an exclusive formaton for both forces. 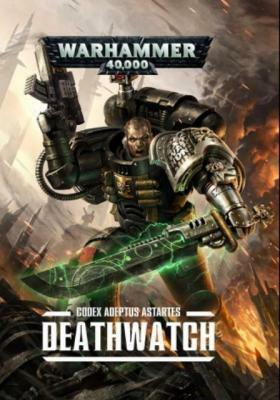 Also included is a 208-page softback copy of Warhammer 40,000: The Rules with an exclusive Watch Captain Artemis cover.